Can't wait to see yours! Hope you had a happy day! Happy Mother's Day. What a sweet picture. What a great reminder to have someone take a photo of us knitting. What a great picture of your Mom. I'm a School Nurse - There has been a couple days that her pic has looked like my life - Day in the Life of a School Nurse Circa 2011. Happy Mother's Day to you and your lovely Mother. Happy Mother's Day to you both! Aw. This photo is so perfect. Thanks for sharing it with us. HAPPY MOTHER'S DAY to you BOTH!!! Knitting is certainly in your blood isn't it. She is so cute! Hope you had a great day Leslie and that you were spoiled rotten! awe! that is great!! Thanks for sharing!! what a wonderful tribute! I hope you both had a wonderful Mother's Day! Oooooooooh, this is good...knitting while on the job - wish I could come up with a way to do that! :) That's awesome! Great picture. I wonder if she still has that object (sweater?) she was knitting. Hope you had a really nice mother's day! Good idea. Never think to have the kids take a picture of me. I took pictures of my own mother on Sunday. Her 88th birthday and Mother's Day. Whew! 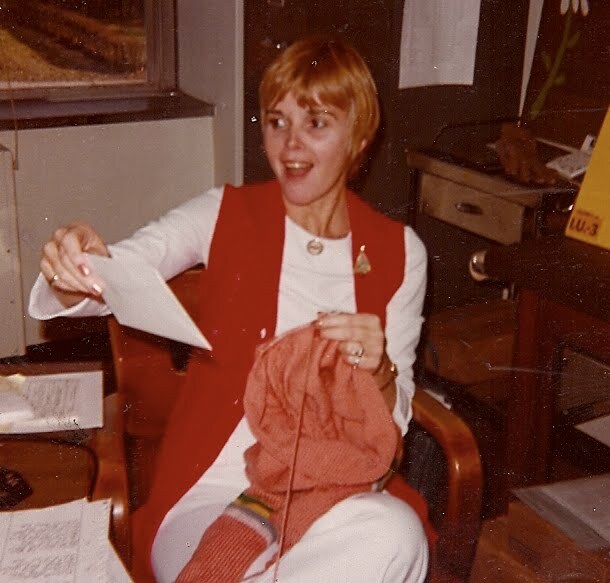 My mom was an obstetrical nurse, she's retired now, but she did a lot of knitting at work too...when it wasn't busy!Happy Mother's Day! Wowza! I don't think I have even one picture of me knitting :( And having been a flight attendent for almost 18 years I did a TON of knitting back and forth across the country while all of my people slept on those red-eyes!